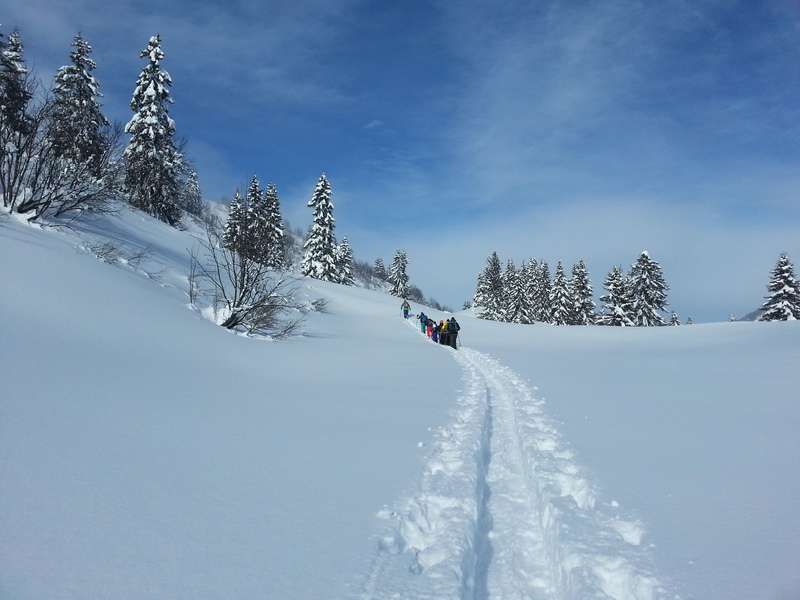 Our second splitboard course this January 2015 (split’n’mix) started off the back of a ginormous storm in the northern Alps which saw well over a meter of snow fall in just a few days. This was a mixed blessing as while we needed the coverage it meant that the already very sketchy snow-pack was now covered in tonnes of fresh snow. The headache was therefore in the guiding for that week – where to go, when to go and how to manage it whilst there? As the usual rules to avalanche danger don’t seem to apply this season it was down to Rider Social guides Rory and Paulo to make some tough calls on where we went. The upshot was that we would generally only ride in those places we already knew had been skied (a lot) or had already slipped previously. It still wasn’t a given that these places were 100% safe and we bailed on a few spots that we weren’t happy with. However, we managed it safely and the guy’s had an amazing time – so good that they have already booked another week with us for next season. We rode some of the deepest powder that I can remember and were blessed with a few bluebird days. Our next split’n’mix week starts on 28th February 2015 and we have just one place left on it. If you are interested then get in touch.